Looking at the iPhone 3G, you might not think it’s too different from its predecessor. But looks can be deceiving. And in the case of the iPhone 3G, they’re very deceiving: the iPhone 3G is a solid improvement over the first-generation iPhone. From its faster Internet connection to its support for GPS and third-party applications to its lower price, the iPhone 3G looks to be a major upgrade. Many things about the iPhone 3G are the same: it requires a 2-year contract with AT&T (subsidized upgrades are available to all iPhone owners and new AT&T customers, as well as select other customers), support for all the same widgets and operating system features, the terrific multi-touch screen, and intelligent sensors that determine whether the phone is near your head and shuts off the screen and the one that knows whether the phone is oriented horizontally or vertically. But while those familiar features are nice, it's the iPhone 3G’s changes that really make the device shine. The phone features of the original iPhone didn’t leave too many people complaining (though it's still missing voice dialing, a feature I'd like). Visual Voicemail felt like a breakthrough (though perhaps it wasn’t quite as useful as its hype would have suggested) and features such as three-way calling were a snap to use. While call quality was decent, more advanced cell phone features such as MMS messaging or certain Bluetooth features were not available. The phone features on the iPhone 3G have all the same strengths and even add one: improved call quality. Because the iPhone 3G uses the 3G phone network which carries more data faster, the call quality when connected to a 3G network is superior — it's noticeably sharper and clearer on both ends of the call. The phone still doesn’t have MMS messaging — a major failing for a device so closely tied to the Internet and media features — but that may be coming from third-party developers. When the original iPhone debuted, it was probably the best music player/phone on the market. And those features haven’t changed: the phone still offers an excellent MP3 player experience, complete with the CoverFlow interface that wowed many early users and the super-fast iTunes Wi-Fi Music Store. Probably the greatest music-related annoyance about the original iPhone — its recessed headphone jack that made most headphones incompatible and forced users to buy adapters — has been fixed. The jack on the iPhone 3G is flush, meaning you can just go back to your favorite headphones, no adapter. On the video side, the iPhone 3G is still a great mobile movie player, too. This model offers the same screen size, resolution, and widescreen orientation for movies, TV shows, and YouTube as the original model. The major thing we would have liked to see improved when it comes to media would have been greater storage capacity. Sure, 16 GB is a decent amount of storage for music alone, but when you add in movies and third-party programs and games (more on that soon), it fills up quickly. Hopefully, iPhones with more capacity are in the offing. One of the major flaws of the first-generation iPhone, especially for a device touted so heavily as an Internet appliance, was its slow ​EDGE network connection. Apple blamed the need for the slower EDGE connection on the strain 3G connections place on batteries (and battery life isn’t exactly the first iPhone’s strong suit as it is). Apparently, that issue’s been solved, because as the name would indicate, the iPhone 3G sports a 3G Internet connection that Apple claims is twice as fast as the EDGE connection (the iPhone 3G still uses EDGE in areas where 3G connections aren’t available). The faster connection will be much appreciated, especially since the iPhone still gives users the full Internet, not a dumbed-down "mobile web." Along with the 3G connection comes another new feature: the ability to talk and download data at the same time. The EDGE network only supports making a call or using the Internet, not both simultaneously. The higher-capacity 3G connection can do both — no more needing to hang up when you want to check your email. One slight annoyance that comes from using 3G is that AT&T's coverage for that network is spottier than for EDGE. This means that in some places where we get fine EDGE coverage, we have little or no 3G service. The iPhone can switch between the two, but there's no automatic failover from 3G to EDGE, which would be nice. Another addition to the iPhone 3G’s data services is the support for pushing calendar and address book content directly to the phone through Microsoft Exchange and Apple’s Mobile Me (nee .Mac). This is a big change and will likely make the iPhone a viable tool for many businesses, putting it in direct competition with the Blackberry and the Treo. A small note, but a very welcome one: Apple has vastly improved the process for deleting more than one email at a time from the phone. What used to be a hassle is now a snap — this is a minor improvement, but one that's going to vastly enhance enjoyment of the device. The other major data/Internet change ushered in with the iPhone 3G is the App Store. This is an online store, much like iTunes, that makes third-party programs and games available for purchase and download (over a wireless connection or from the desktop) to iPhone, iPhone 3G, and iPod touch users running the iPhone 2.0 software. The original iPhone was locked down tightly, with Apple constantly wrestling with developers who wanted to install programs. Apple has now embraced them with the App Store. Programs will run US$0.99 to $999, though most are under $10 and many are free. Though Apple controls developer access to the App Store (a negative in our book), the range of available programs should greatly open the iPhone’s capabilities. We've only spent limited time using the App Store, but this looks to be a gigantic expansion of the phone's capabilities that may vault Apple ahead of the pack. The App Store is a snap to use and is chock-full of great programs, including Remote, which turns the iPhone 3G into a remote control for iTunes or the Apple TV. If a steady supply of good programs continues (there's no reason to think it won't), the iPhone could become just as versatile as any desktop or mobile computer. Given the iPhone’s motion sensitivity, third-party developers could make the iPhone a hit gaming platform combining the best aspects of mobile gaming with motion sensitivity found in things like the Nintendo Wii remote. Other input options. The iPhone’s onscreen keyboard is OK for quick messages, but for real writing a collapsible keyboard and a word processing program would make a true mobile workplace. Support through Safari for Google Docs or a similar online office suite. Access to the Dock Connector for third party developers, something Apple hasn’t allowed yet, since that could open up a whole suite of interesting applications. Now that developers can take officially sanctioned cracks at the device, these developments seem more likely than ever. Another major addition to the iPhone 3G is the inclusion of A-GPS (Assisted GPS). While the first-generation iPhone had rough location-awareness features through cell phone triangulation, the new version sports full GPS. While this opens up an array of options for new, location-aware programs, the place most users will initially experience it is as part of the phone’s Maps program, which provides driving directions. This is not the same thing as an in-car navigation system, though. That functionality, or turn-by-turn directions spoken by the system, is not yet available on the iPhone 3G. It could come later via third-party programs, but for now, your iPhone won’t replace your car navigation system, making this GPS implementation neat, but not revolutionary — until developers start creating awesome location-aware applications, that is. One of the most common complaints about the first-generation iPhone was its camera: just 2 megapixels in an era when many phones offer 5 megapixels or more (it also doesn't record video, another feature I'd like to see). For those of you hoping for an improvement on that front, we have bad news: the iPhone 3G has the same 2 MP camera as its predecessor. That limitation, especially for those most interested in taking photos with their phones, will likely continue to frustrate, as will the lack of built-in zoom. Though some counter the conventional wisdom that more megapixels are always better, here’s hoping Apple can improve the camera on future versions of the phone. One place where the iPhone 3G doesn’t deviate much from the original model is its size and weight. This incarnation of the phone is 0.1 ounces lighter than the original, though it’s slightly thicker. Despite hardly featuring changes in this department, the iPhone 3G feels much better in your hands. This is because Apple has tapered the edges of the phone, while leaving the middle fat. This not only makes the phone easier to grip, it also makes it feel much thinner in your hand, even though it's not. It's a neat trick and one that really improves the phone's ergonomics. 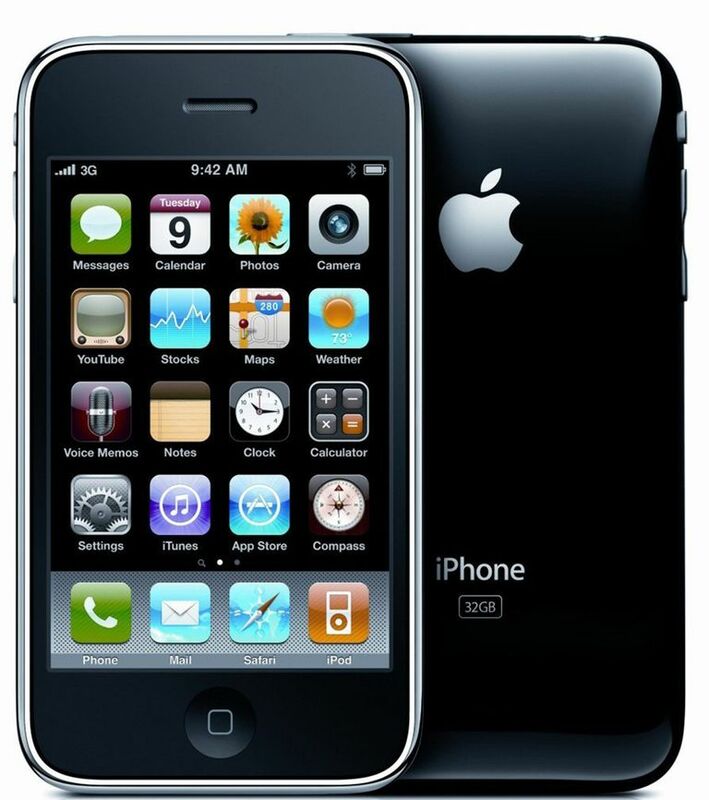 The iPhone 3G also has a glossy black plastic back that reportedly shows finger smudges more than the original. Though not a performance issue, it would be nice if Apple could design a case that didn’t highlight finger grease so much. Perhaps the most serious Achilles heel of the first-generation iPhone was its less-than-stellar battery life. Though there were techniques to squeeze out more capacity, it still didn’t wow you with its stamina. On this front, the iPhone 3G faces an even steeper challenge — the 3G connection drains battery life even faster. Apple rates the iPhone 3G’s battery as offering as much audio playback as the first model (24 hours) and nearly the same video and web use time (7 and 5 hours respectively). Talk time on 3G, however, loses 3 hours when compared to the original model, dropping to just 5 hours. These ratings seems about right. In early use, we only get about a day's worth of use from the phone before needing to recharge it. This is perhaps the phone's greatest shortcoming. With the drive to keep the phone thin, small, and light, it seems unlikely that Apple’s will squeeze much more battery capacity out of this design, and that may be a real problem — five hours of talk time isn’t much. While this opens a space for accessory makers to offer extended-life batteries, weak battery life is certainly a failing of the iPhone 3G. All in all, the iPhone 3G is a solid upgrade over the original model. Just how much of an upgrade it is, though, depends on where you’re coming from. If you don’t have an iPhone right now, the new features and lower price make it an excellent value and worth serious consideration. If you do have an iPhone, the upgrade will likely make the most sense if you’ve got the disposable cash, are willing to be tied to AT&T for another two years, or are straining for a faster Internet connection. If not, though, and despite how good the iPhone 3G is, you may want to wait another 6 months or so — after all, remember that the first iPhone got a price cut and a capacity bump part-way through its lifecycle. Sometimes good things come to those who wait.